Following six years on permanent exhibition at Tate Britain, The Andrew Lloyd Webber Foundation is delighted to be loaning its "London: The Old Horse Guards from St James's Park" by Canaletto to 'Canaletto: Celebrating Britain'. The exhibition opens at Compton Verney on 14 March and tours to the Holburne Museum and the Abbot Hall Art Gallery. 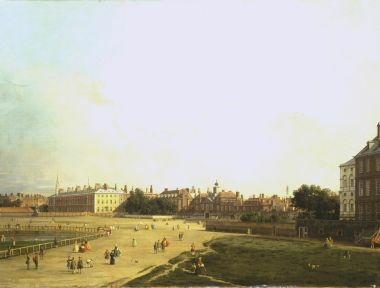 The painting will be shown for the first time alongside a largely unknown Canaletto view of the new Horse Guards building in Whitehall, from a private collection. Click here to read the press release.